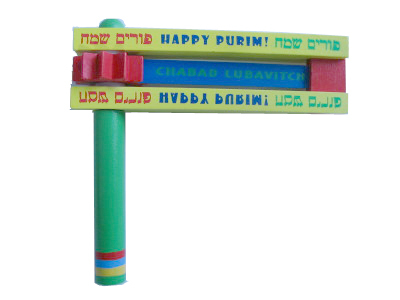 There is also a device called the Purim "gragger", which is a noisemaker. When the Purim story is read aloud from the book of Esther everyone boos and shakes their graggers whenever Haman's name is mentioned! (I'm not kidding - it sounds like fun to me! 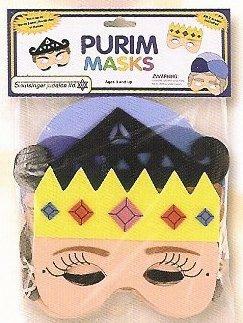 :) More on Purim graggers, including how you can make your own, is online here. 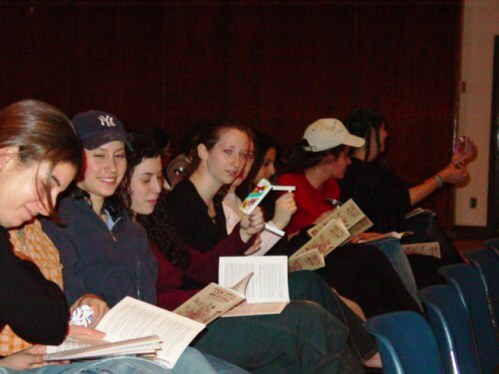 Below is a picture of a gragger, and below that is a picture of a woman shaking a gragger at the sound of Haman's name being read during Purim! New Testament - Today in First Corinthians chapter 13 we will read verses that you have likely heard many times at many weddings. It is the “Love” chapter of the Bible. This chapter goes way beyond just romantic or marital love – it gets at how we live our very lives each and every moment in relationship to all of creation. In verses 1 through 3 we read: “If I speak in the tongues of men and of angels, but have not love, I am only a resounding gong or a clanging cymbal. If I have the gift of prophecy and can fathom all mysteries and all knowledge, and if I have a faith that can move mountains, but have not love, I am nothing. If I give all I possess to the poor and surrender my body to the flames, but have not love, I gain nothing.” How do these verses speak to you? Do you notice the juxtaposition of the concept of love and the concept of nothingness? 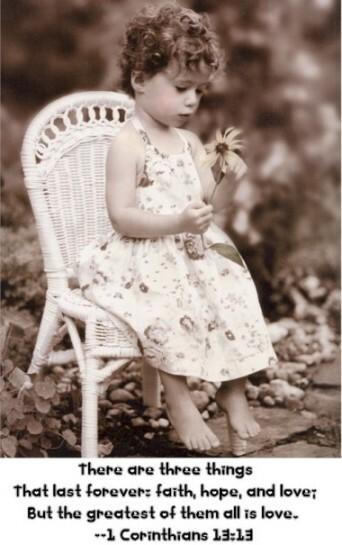 Do you see that without love there is nothing? Do you believe that if we live our lives without love, we are nothing? Even if we have amazing spiritual gifts. Even if we have faith that can move mountains. Even if we give away all of our possessions to the poor. If we do not have love, we are nothing. We gain nothing. We give nothing. Do you see how important love is in our lives? Do you see that we must live each and every day from a starting point of love? Why do you suppose Paul spends this entire chapter telling us about the importance of love? Do you think that God is love and wants us to be love as well? I love (pun intended :) how this chapter ends: “And now these three remain: faith, hope and love. But the greatest of these is love.” Amen and amen. Worship God: As we're reading one of the Love chapters of the Bible today, Rebecca St. James and Chris Tomlin's "Expressions of Your Love" seems appropriate! I love the lines in this song: "Jesus make me an expression of You. 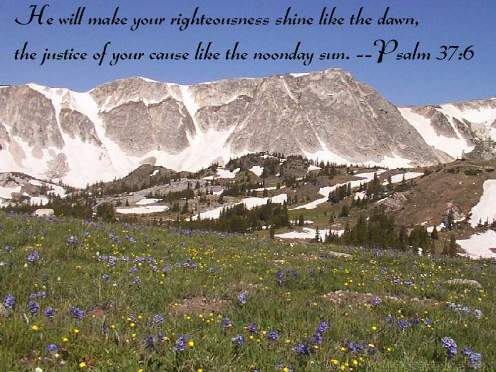 Expressions of your glory. Expressions of your heart. Expressions of your love!" What I’ve learned after my “Esther” melt-down (see August 18th) is this: God is in control no matter who is on the throne. God is in control even when “His” people, the Jew or Christian fail to acknowledge Him and act like His people. (The Book of Esther is a secular book whose main characters, thou Jewish, are secular.) God can take any situation and use it for His glory even when the participants do not know they are being used to bring about God’s purpose. Because God’s Word is “incorruptible” (You have been born anew, not from perishable but from imperishable seed, through the living and enduring word of God. (1 Peter 1:23 NET. )), even when used wrongly by those who call themselves His people, the integrity of His Word can still take root in a heart that holds “Good Soil,” and give root to a 30, 40, and yes even a 100 fold harvest (Matthew 13:8). Paul is essentially telling the church they are 1) not acting in love which is a fruit of the Sprit and not a gift of the Sprit. Fruit and Gifts are two different things fruit is a by-product of seed, soil and the interaction of the environment (air, rain and fertilizer). Remember we are the branches of the Vine, Jesus Christ, and we produce fruit by being attached to that Vine. We can operate either out of the works of the flesh, or the Fruit of the Spirit, we have a choice. However as Paul points out, Love, a fruit, is the better way. We are to operate in the gift or gifts God gives us through the Holy Spirit, they don’t belong to us and we cannot manufacture them. it only leads to harm. The rage, the envy we exhibit against all those wrong doers does nothing to them but it absolutely kills us. We do it because we think God is not looking out for us or that He is senile and forgotten about us. We may even think that God is out to get us because we are always being caught when we do something wrong then we think wrongly that others do not. What we need to do is stop doing the things we know that are wrong especially when we do what is wrong because the well renowned “They” and “Mr. and Ms Somebody” gets away with it. Those who know better, do wrong, and are caught should rejoice at being caught because the punishment for that one infraction will be less severe than the punishment for a multitude of wrongdoing. We reap what we sow, that is a universal law; sow a lot of wrongdoing, you will get a great harvest, and remember: the crop harvested looks nothing like the seed sown, and it’s bigger. 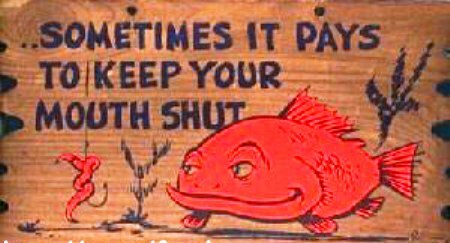 23If you keep your mouth shut, you will stay out of trouble.